Cartmel Holiday Cottages presents Woodland Cottage and Broughton Bank Cottage, with WiFi, both situated between Wood Broughton and Greenbank, Cartmel, actually on the coast to coast cycle route, benefitting from a mild climate thanks to the warm air of the Gulf Stream. .
Woodland Cottage offers beautiful valley views of Cartmel valley from 300 feet, this cosy cottage is set on its own in farmland on a very quiet road in restful countryside. The cottage is just 400 yards from Broughton Bank. Recently refurbished to high standards, it sleeps 4, with one double and one twin bedded room. Polished wood floors throughout. Lockable shed for cycles and other belongings. Drying area and laundry room with tiled floor. Large walled garden with mature trees and patio. Recently refurbished, very comfortable accommodation with open fireplace and large walled garden. Central heating and partial double glazing. Now there's also WiFi. 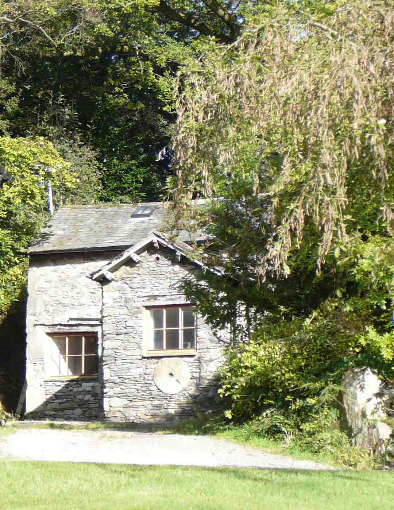 Broughton Bank Cottage is also a detached cottage, in the grounds of the owners' property. On 3 levels, with one double and one twin bedroom and two bathrooms, it has just been completely renovated. The garden is raised and secluded, complete with outside seating and dining area, views over a peaceful wooded pond, even a herb garden with fresh herbs for that special meal. Cosy inside with warm solid walnut floors courtesy of the environmentally friendly ground source heating system; some of the electricity is generated on the property as well. Doors, cills and skirting boards are made from a pine tree felled in the garden. One bathroom has a bath, the other has a shower. Plenty of room for parking at both cottages; cyclists, walkers, disabled, babies and dogs welcome. Cartmel with shops, steeplechase course, restaurant and pubs 1 mile. South of the A590 is always a little quieter than the central Lakes, north of the A590. Grange-over-Sands with golf course 2 miles. Steam railway, motor museum, Holker Hall stately home, horse riding, Lake Windermere and coast within five miles. 15 miles M6 Jn 36. The southern tip of Windermere is about 5 miles away. From Cartmel leave on the main road north to Newby Bridge. Pass out of the village into open farmland. Take the first left turn. Follow this road past Aynsome Manor Hotel and up the hill at Greenbank. Pass Greenbank farm on the bend and at the top bear right at the junction. Woodland Cottage is directly after this on the right hand side. Broughton Bank is 400 yards further on left. Letting week runs from Friday to Friday. Short breaks available. �25 charge for pets, everything else - linen, towels, heating, electricity WiFi and some wood for the fires - included.